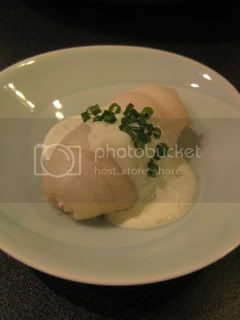 HAPPY DONABE LIFE - Mrs. Donabe's Rustic Japanese Kitchen: Donabe steam-roasted dover sole...in microwave! with my new donabe steam-roaster TOCHINSAI. Cleaned filets of dover sole were seasoned with salt & pepper (inner-side only) and rolled. 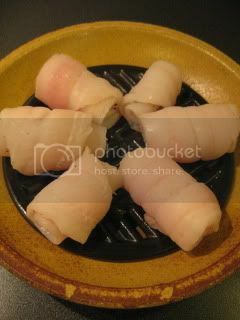 They were arranged in TOCHINSAI with the grate (black-side up). Meanwhile, the lid was soaked in water for 1 minute and drained. TOCHINSAI was covered with the lid and microwaved for 5-6 minutes. After cooking, TOCHINSAI was let sit for a couple of minutes (there is carry-over heat). Meanwhile, I made a simple sauce by mixing creme fraiche with a little amount of yuzu kosho and lime juice. 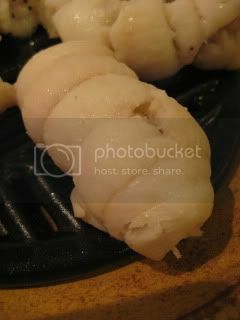 Donabe steam-roasted dover sole was ready! It looked so pure. Fish was served with the simple yuzu-kosho & creme fraiche sauce (1/4 cup creme fraiche + 1 teaspoon yuzu-kosho + a little white pepper + a little squeeze of lime juice) and some chopped chives. It was so moist and just delicious. I posted the recipe on toiro's website. So, please check it out.